Grow your links at the right pace. Let′s think: normally sites do not get thousands of backlinks overnight. It doesn′t happen that often that crowds of people all of a sudden put links to you, all within a day or two. As this doesn′t look natural, Google may pretty well frown on this. All right, you may think But why do these link farms still exist, maybe it′s not that bad at all? Hm... here′s what happened with my friend′s website. He was selling snowmaking equipment. 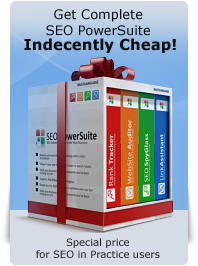 The competition there isn′t severe and after doing simple on–page optimization and arranging a couple of links he easily got a #5 place in Google for the keyphrase snow blowing machine. Sure, he wished to get higher — and he went to those link farms. Mitch got about half a million links one day, and some hundred thousand more next day. I mean, he practically got them all at once. And — instead of the higher rank he expected he got... what do you think? Lowered in ranking? Not that simple. Totally dropped from top 10 results — for quite a long time! Sure this was a bad lesson. Therefore, do NOT get thousands of links pointing to your website all at once. If you do this, you are asking Search Engines for trouble. Better increase the number of your backlinks gradually. For instance, raise the number of backlinks you get slowly but surely, by 30 to 50 links a week. Hope you remember that they should also target diverse anchor texts and not just commercial ones. This helps you stay in the clear and build your links the natural way. Moreover, it′s better to be getting links regularly, without long breaks. For instance, it′s better to get 30 links each week than 500 links today and then nothing for the whole month. Links can sit on different pages of a website, and this makes surprisingly big difference for how profitable a link is. Let′s talk about this. Sitewide links: safe or not? Some sites will place a link to you on each page of the site — and this link is called sitewide. As a rule this link will be sitting on the same place of each page, like footer, blogroll or sidebar. A sitewide link has good potential to bring you traffic — as it can be found on every page, the same user will see the same link numbers of times. Sure, this makes bigger chances that sooner or later the link will get a click. However, today sitewide links can bring you more bad than do any good: if Search Engines assume that your sitewide link is paid — they might penalize your website and lower your ranking. Besides, if you get a hundred of links from the same domain it won′t bring as much value as 10 links from 10 different domains could bring, because diversity matters. That′s how Matt Cutts puts it in one of his videos: "If we see a link from a domain, we might count it once, but if we see 50 links from a domain, we still might choose to only count it once". "…if I were a manual webspam analyst, sort of doing an investigation, and we got a spam report, you′re an English site, and you′ve got a site–wide Polish link or something like that or vice versa, it looks commercial or it looks off–topic, low–quality or spammy, then that can affect the assessment on whether you want to trust the out–going links from that site." Also, it is quite easy to see that a link in a blogroll with any anchor text other than the name of the website is unnatural. So with sitewides, you should be careful. By the way, if you′re getting them for traffic only, then you can use the rel="nofollow" attribute to be on the safe side. A link from a homepage has a lot of value, and it′ll hardly look suspicious to Search Engines (like sitewide links do). If you have an inbound link from a PageRank 5 homepage, this is a big add up to your rankings — and looks quite natural. A link can also stand on an inner page — any page deeper than a site′s homepage. A link from a deeper page is not so valuable as, say, a link from the homepage. But if a homepage has a PageRank of 6, part of this will definitely pass to the inner page that′s linking to you — and in turn, you′ll also get part of its high rank. Moreover, some inner pages rank very high themselves — so they can be really good. And, as links from deeper pages are not tremendously weighty, you will get these much easier than links from homepages or sitewide links. So don′t waive the idea of getting links from inner pages. I am very much enjoying your course and getting valuable information about SEO. Thank you very much for it! I have a doubt, possibly a stupid one and the answer may be evident but I cannot see it: If I got hundreds of inbound links I would have to reciprocate and put hundreds of outbound links in my site. Where would I find the space for so many links in my pages? In such cases it is recommended to create a separate page where all your backlink partners (the links to their sites) are placed. This is what you can do using LinkAssistant software. Actually you can learn more about this in further chapters. what about if you are a web designer and have several running websites, could you in reality have a site wide link on each oage of one of your other sites pointing to your site. @Joek Based on my understanding, providing those other websites are not hosted on the same IP address as each other, than you can benefit from the sitewide links. If they are all hosted at the same location, then the PR influence would be reduced as the robots/spiders look to the server IP address as part of their link weight grading. Does google rank well for for people who do link exchange? Meaning i link to you and u link to me. Why would google penalize a website for being in a linkfarm? It seems to make more sense that it would ignore the linkfarm link? If it were penalized, wouldn't be too easy for the competition to submit your site to a linkfarm, so you are penalized? Google really loves natural way of link building, so getting links regularly and from different places is a good factor. I do run several projects. All of them with several subdomains. So, when I search for Linkpartners, there might be 10.000 results at a time. with head tag : meta....noindex-nofollow..
on each of the Directorys category pages, just for validation time. So this should be okay!? "...but not from a subdomain..."
This is lots of work, criss cross mailing, etc. too much as I have to take care of other projects parallely. But, that Mainpage is already very well positioned for all I need countrywide, but I want more... of course. At this very moment I do run the (for the moment)last big "Campaign", before starting buisiness, with 21K URL`s, to then choose from the best. (*Disallow, noindex. nofollow on a 15 to 20 URL`s per page based directory f.e.)?? Are there bots out there, which would not follow the robots .txt and meta tags,and maybe even share their results with some of the big SE`s?? I will not risk to fall down for linkspamming again, like it already happened once. I was already reincluded once. I can not believe that there would be a way, to pupulate some several thousand links on any website, in a week or so, without to be thrown out by their automatic filters, or is there ? technically the search engines will no know about these links. The search-engine bots "obey" the robots.txt files ( http://googleblog.blogspot.com/2007/01/controlling-how-search-engines-access.html ), but the bots from some services do not (seo moz for instance). So most probably there will be no problem with that, unless Google clearly does not follow the rules it sets up - but that is not probable at all. So cover the pages with meta tags and robots.txt and do what you need - but I would still suggest to do it in portions, - that is upload 100 URLs in one week, 500 URLs in another week, then 1000 more, then 5000 more etc. until you have all of them, just in case. You should be fine that way. of course, I would not either. Anyway, to do it in portions sounds good, is also seems to be the best way to make sure I have many variations of Anchor Texts. Just by changing it every time, before sending out the next "Linkrequest-Portion". After all I think, to put it first on a subdomain, with the explaination that I would not upload that amount of links to my orig. page, and that it is just for evaluation purposes lets experienced webmasters understand, that I would do the best to provide best possible Quality for their Backlinks?! On my Mainpage I would just upload the scriptpage (.....com/links) of the generated LA- Tool directory , for those who want to edit their links manually. In former Projects, many webmasters prefered to use the script, when I added the script URL to the Linkrequest template! To use the mets tags of the possible Linkpartners Domain, for description etc.- isn`t that a kind of DC (duplicate content) too? Shouldn`t we animate the others to edit their desciption for that reason? Is using them a kind of "serious DC"? Thanks for your kind help so far. "Link- Assistant" does not only help to push buisiness, it almost guarantees for it. No, that would be fine. Meta description is too small a code element to cause any trouble. Otherwise what you are going to do sounds perfectly fine. Kindly tell me in little detail 2 paragraph please. I want to make them more clear. The first one is "To stay safe, sometimes it's good to find a site that recently put sitewide links to someone else. I mean, if you see that some person has a sitewide link and is OK with it — "
over here when you say "it's good to find a site that recently put sitewide links to someone else" you mean another website which has sitewide link of any third website? We should also ask them to get a sitewide link for our website? The other paragraph is "A link from a deeper page is not so valuable as, say, a link from a homepage. But if a homepage has a PageRank of 6, part of this will definitely pass to the inner page that's linking to you — and in turn, you'll also get part of its high rank. Moreover, some inner pages rank very high themselves — so they can be really good. And, as links from deeper pages are not tremendously weighty, you will get these much easier than links from homepages or sitewide links. So don't waive the idea of getting links from inner pages." Over here by the word inner page you mean the webpages of our own site? More over in this paragraph you mean few of our webpages are ranked high so we should link the lower ranked pages with high ranked pages? is that so? "over here when you say "it's good to find a site that recently put sitewide links to someone else" you mean another website which has sitewide link of any third website? We should also ask them to get a sitewide link for our website?" Not really "should" - but you could be sure that this link brings value to the other side and try to get one as well, yes. But generally site-wide links are not the best option as they might get considered as paid links by Google and won't have any value. "Over here by the word inner page you mean the webpages of our own site?" "More over in this paragraph you mean few of our webpages are ranked high so we should link the lower ranked pages with high ranked pages? is that so?" Yes, if you link a high-PR page to a low-PR page of your own site, naturally the PR will get passed over. Sitewides won't harm you. BUT if you get them all at once, there's a big chance that they will only qualify as just one link. That's why it is better to get same-domain links gradually. This book is fantastic, but as usual I have questions. I'll have to check back at this site later to get all of the answers. Okay, sitewide links on large site may result in me getting a lot of links fast. If there was a HUGE site with a ton of content, and like 1,000 pages indexed and I knew the site owner, would getting that "one" link sitewide count as one, or 1,000? Is there a rule of thumb on how many links to get per month or a general growth rate? Should I stay away from sitewide links from large site on a new domain for a few months of gradual link building?